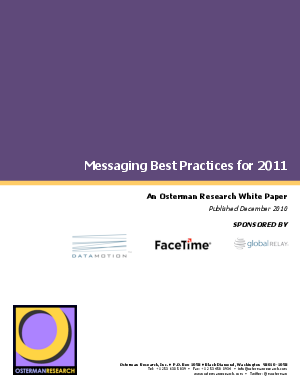 This brief is an adjunct to a Webinar that was conducted by Osterman Research in early November 2010. It provides some guidelines that we feel are important for organizations to follow in the context of how they manage their messaging environments. It offers our point of view based on the extensive research that we conduct on an ongoing basis with IT decision makers and influencers. It has been sponsored by DataMotion, FaceTime and Global Relay.